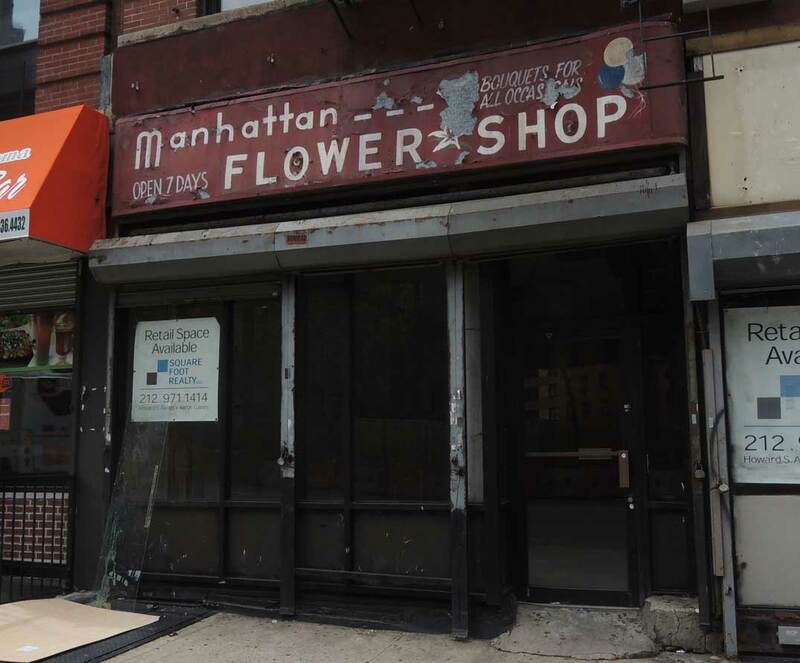 The Manhattan Flower Shop was located here at 3165 Broadway near the southwest corner of Tiemann Place from the mid-1950s until 1999. The business began in 1910 as Zacharias Papagelis, Florist at 2816 Broadway. The original owner was Zacharias Papageles (1879-1926), an immigrant from Greece. Papageles spelled his Americanized name in a variety of forms over the years. In 1905 he was a passenger on the SS St. Louis sailing from Cherbourg, France, 13 August 1905, to the port of New York, when he was Zacharias Pappagelis, age 29, a Greek farmer, whose last residence was Sparta, Greece. His destination was Chicago, Illinois, where his father, recorded as Pappagelis Socratis, lived at 259 South Halstead Street. In 1918 he registered for the World War I draft when he was Zahareas Soteros Papageles, age 39, born 20 July 1879, an alien resident, living at 249 West 109th St., New York City, NY. In the 1920 U. S. Census he was Zaharias Papagal, age 38, born Greece, immigrated 1905, alien, Florist, living at 249 West 109th St., Manhattan. With him were his wife, Georgia, three children, and a cousin, George Stavros. In 1926 he becane a U. S. citizen when he was Zahareas Soterios Pappageles, a florist, born 5 July 1879 in Vassara, Greece. He emigrated from Le Havre, France, 8 August 1905, and arrived at the port of New York 15 August 1905, aboard the vessel New York. Papageles died that same year, 1926, age 45, on 30 July 1926 in Manhattan. On the death of Papageles, the Manhattan Flower Shop, at that time located at 3182 Broadway, on the east side of Broadway, near 125th St., seems to have been taken over by his widow, Georgia Papageles (1882-1976) and his son-in-law, John Hanges (1885-1959). A bankruptcy notice in 1910 indicates that Hanges and Papageles were partners in an early predecessor to the Manhattan Flower Shop, under the business name, Hanges and Papagelis at 258 West 116th St. Hanges married Papageles' daughter, Beatrice J. Papageles (1903-1988). Like Papageles, Hanges was an immigrant from Greece, and became a naturalized U. S. citizen in 1926. His naturalization petition, 6 December 1926, says that he was born 15 September 1885 in Vassaram, Greece, and that he emigrated from Cherbourg, France, 5 May 1903. He appeared in both the 1930 & 1940 U. S. Census living at 181 Claremont Avenue, within a short block of the shops at 3182 Broadway and 3165 Broadway. In 1942 he registered for the World War II draft, age 57, born 30 October 1885, Greece, and employed by Gerra Papageles, 3182 Broadway. Gerra Papageles, presumably, was Georgia Papageles, his mother-in-law.